Warmer weather on the horizon means that Mike and I are planning on heading out to our patio more, which means drinks and nibbles as the nights start to get longer. 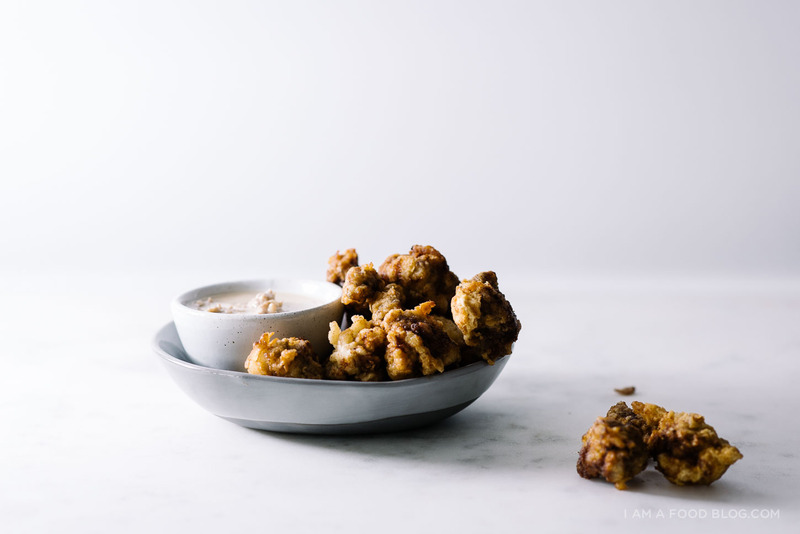 I hardly ever (read: never) drink without having something to snack on and even though I’m not the biggest indulger, I absolutely love coming up with drink pairings. There’s something so satisfying about figuring out what goes with what. 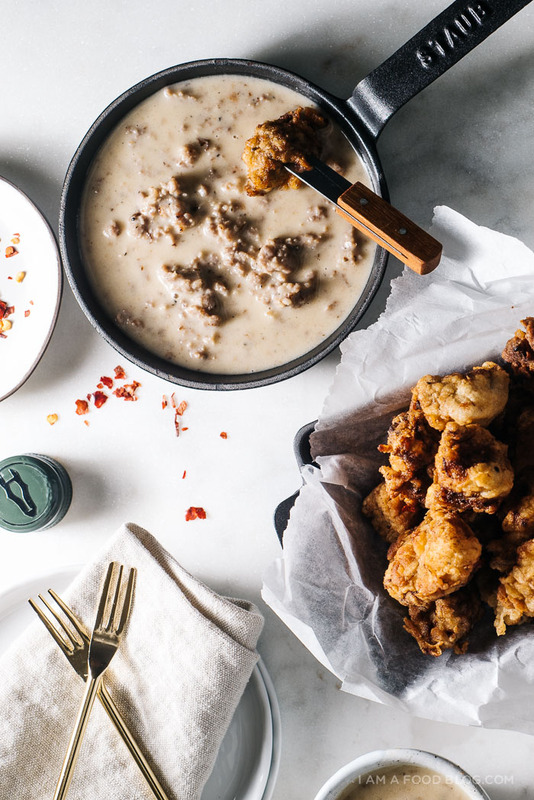 I partnered up with Dark Horse Wine to bring you this unexpected pairing of Sauvignon Blanc with crispy, crunchy chicken fried steak bites and white wine sausage gravy. 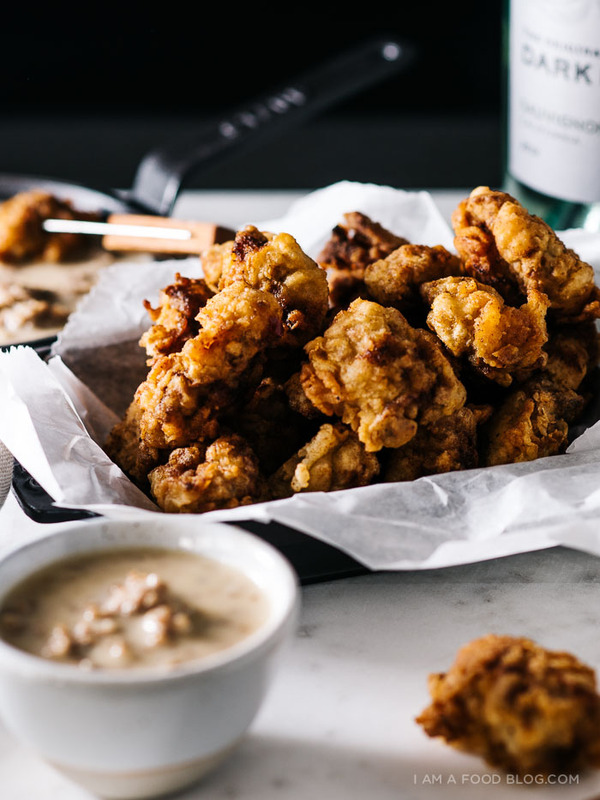 Their light, crisp, refreshing white is the perfect foil against deep-fried deliciousness. All of their wines are under $10, so they’re perfect value for money. 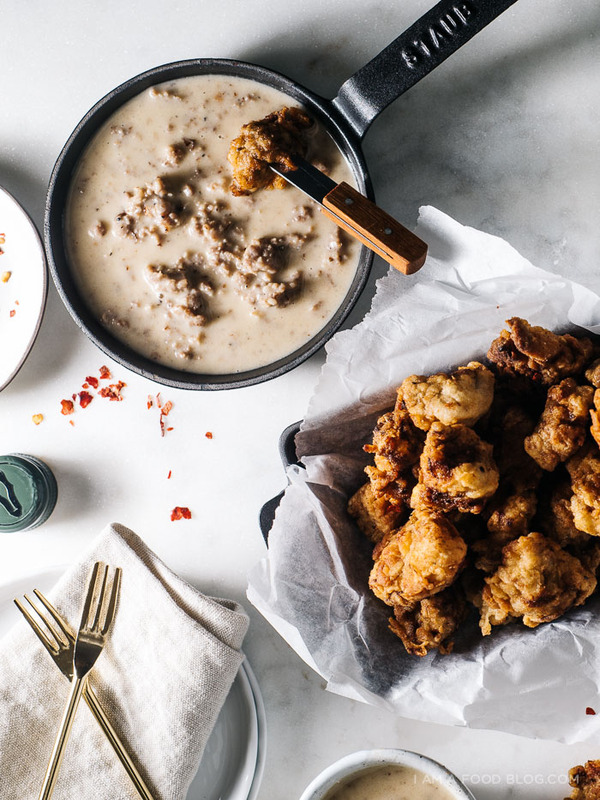 I’m sure I’ve said this before, but I’m still not sure why battered, deep-fried steak is called chicken-fried. I kind of get it, but at the same time, deep-fried steak makes sense to me too. Regardless, chicken fried steak is delicious. I had the chance to have the real deal (I hope!) while I was in Dallas last year and I was absolutely smitten. So smitten that I had two chicken fried steaks in under 24 hours. It was okay though because I was only in town for two days, so really, it just meant that I ate one for lunch one day, and then again the next. 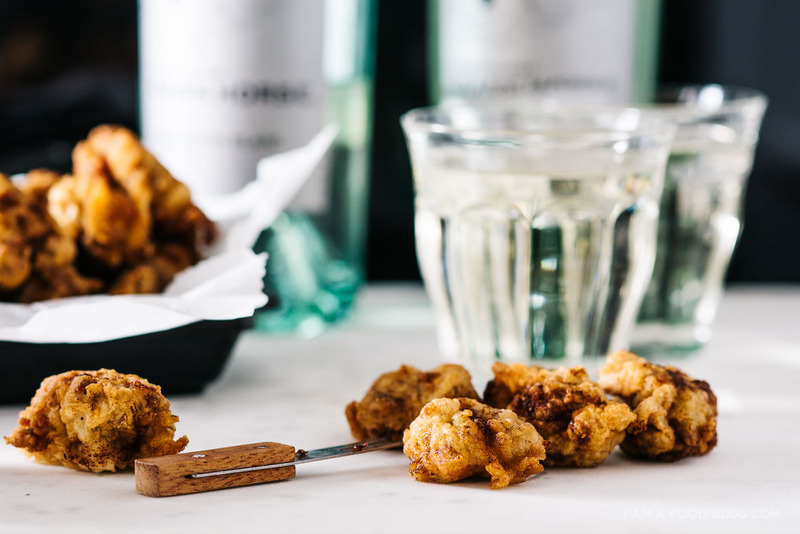 As much as I love the knife and fork aspect of chicken fried steak, I wanted to create a more bar-style snack to go with the Sauvignon Blanc. It wasn’t much of a stretch for me to create steak bites, seeing as I am absurdly obsessed with miniature foods. Most people don’t think of Sauvignon Blanc as something to have with bar snacks, but I really liked the contrast of the delicate citrus notes paired with the in-your-face flavor of the steak bites. This is my kind of steak: bite-sized, deep-fried, dip-able, and delicious. Cheers to Spring! Season the steak cubes generously with salt and pepper. In a shallow bowl, whisk together the flour, potato starch and spices. Whisk the buttermilk into the flour. This helps create extra crunchy bits. 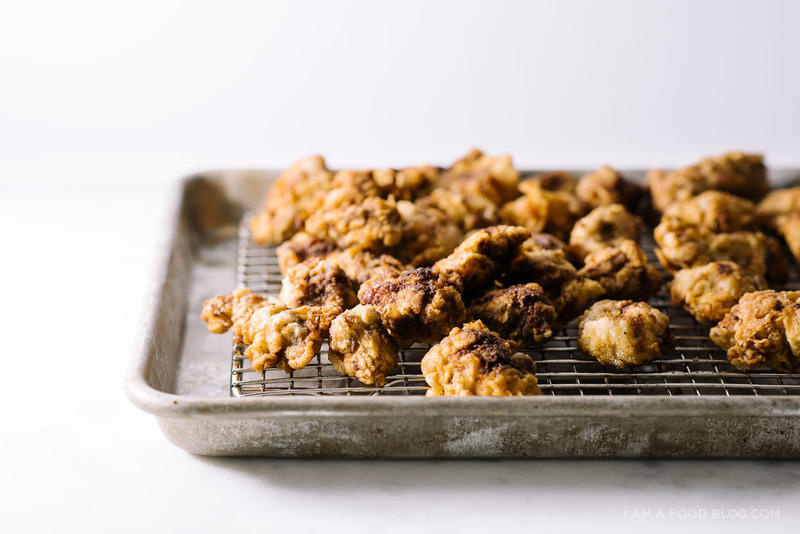 If you don’t have buttermilk on hand, you can skip this step. In another shallow bowl, lightly whisk the egg. Toss the steak cubes into the flour mix, then the whisked egg, then back into the flour. Let floured steak pieces rest on a plate/tray while you heat up your oil – it helps with crunch. Fry the steak pieces, being careful not to crowd the pan, until deeply golden brown and crispy, about 5-6 minutes, flipping if needed. Drain the steak bites on your prepared rack and keep warm in the oven while you make your gravy. Over medium-high heat, in heavy bottomed skillet, cook the sausage, breaking into pieces, until brown and cooked through. Sprinkle on the flour, stir and cook for a minute or two. Pour the wine into the pan in a slow stream, stirring constantly. Add the milk and cook, stirring frequently until the gravy thickens. Season with salt and plenty of freshly ground pepper. Enjoy hot. 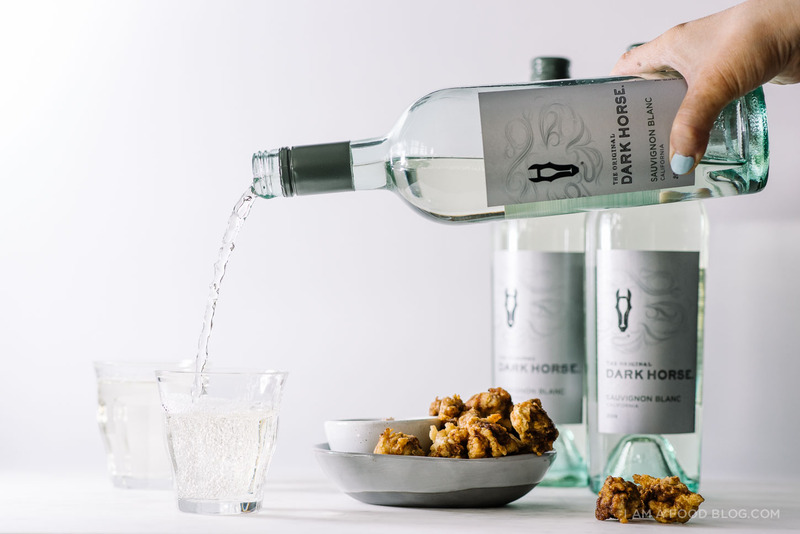 This post was sponsored by Dark Horse Wine – follow them on Twitter and Instagram for other unexpected wine pairings. Thank you for supporting the sponsors that help keep I am a Food Blog up and running! My desk is now saturated by a pool of drool. Also, I am confused by chicken fried steak too. Not sure if it’s an American thing… but I would most likely expect to receive chicken…. then pleasantly surprised by the appearance of steak. Either way, yum. I heart the idea of doing a bite-size version! My husband orders chicken fried steak whenever we’re in the south and the sheer size of it always weirds me out…that plus the fact that he can eat the entire thing in about five minutes. But bite size is perfect! also, the point of drinking is to eat salty snacks, right? wait. maybe not. I am the same way; I never drink without a delicious nibble to go along with it. They each are part of the experience. My mouth is watering! These look delicious Steph. Um, yes, yes, to all of this! Stephanie, we’re twins!!! It looks amazing! Awesome photographs….as always!! These little bites are so cute, Steph! I just adore all your mini recipes. xoxo! I love that you added wine to the gravy! These bites look fantastic! these look soooo good, I am afraid that if I cook them I wont be able to stop cooking them. 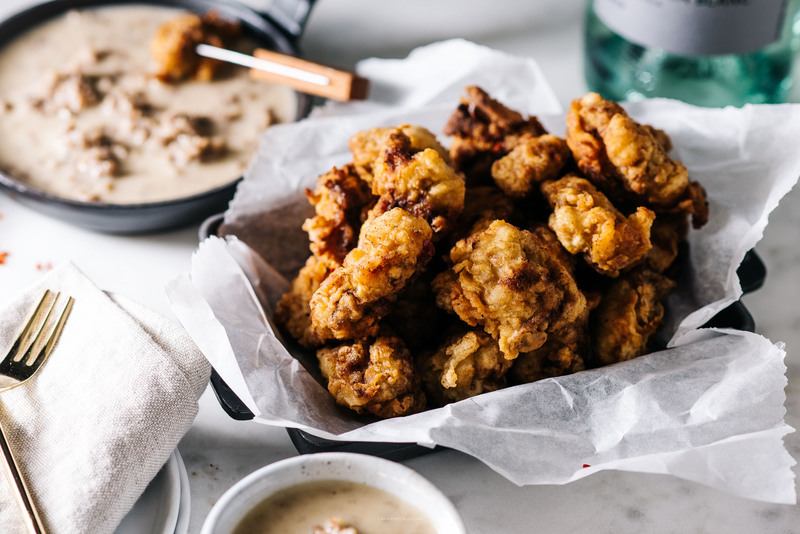 Hi Steph – just cooked this recipe – HUGE HIT with the kids – BUT mine didn’t look as crispy as yours…its it dredge in flour, dip in egg, then back in flour? i only dredged in flour, then egg, and let rest on a baking sheet. oh my gosh, yes, flour, egg, then flour again! i’ve updated the recipe. thanks for letting me know! so happy your kids liked it anyway and hope you get a chance to make it again! 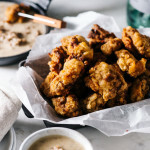 I am a fan of biscuits with sausage gravy, so I am totally in love with this appetizer (because biscuits are great, but often fried chicken > biscuits)! Also love the idea of using white wine to add another layer of flavor to the gray. Yum! The picture got me! They kind of look like walnuts, don’t they? Delicious, I must say. Chicken fried steak is one of my favorite meals. I will need to try these bites. They look fabulous and so does the gravy. Wine and gravy??? Yum!!! This looks delicious im going to be using this in the future. P.S.